Brac Reef Resort has forty guest rooms divided between two 2-story "treetop height" buildings, surrounded by lush tropical foliage and landscaped gardens. Reef Divers, the onsite dive operator, provides first-class “valet” service, top-rated equipment and a modern fleet of specially designed dive boats. Their professional instructors and boat captains balance concern for your dive safety and care of the environment with a commitment to give you an unforgettable and completely unique diving experience. Reef Divers offers guided SCUBA diving boat tours; snorkeling trips; complete PADI, NAUI and SSI instructional programs (including one-day resort courses, 4-day full certifications, advanced training and Nitrox certification); an air-conditioned classroom; 150 aluminum 80 cu. ft. and 63 cu. 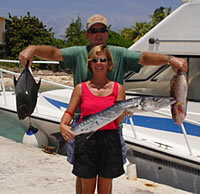 ft. SCUBA tanks, as well as 15 complete sets of Sherwood rental equipment; and an equipment repair service. The Dive Center also sells a complete selection of SCUBA diving equipment, accessories and Reef Divers and Brac Reef Beach Resort logo dive sportswear. 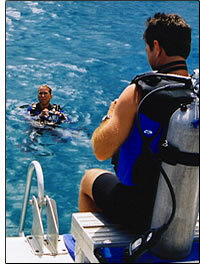 The Reef Divers dive center provides fresh water rinsing tanks, fresh water showers, a dive gear storage area, and restrooms. Reef Divers uses Mako 20 cfm and Bauer 16 cfm electric-powered, air-cooled dive compressors, complete with state-of-the-art filtration system and plenty of air storage capacity. 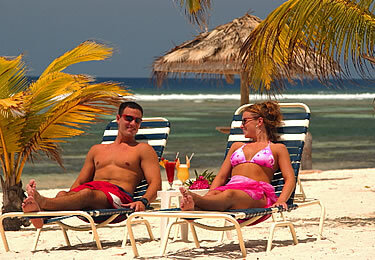 The Palms Restaurant tempts you with the taste of the tropics as well as serving American and continental cuisines. 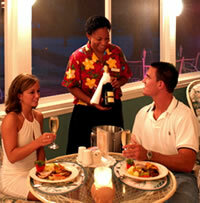 Their internationally trained chefs feature menus including delicious seafood, island favorites and gourmet desserts. If you have special dietary needs, every effort will be made to accommodate those needs. Breakfast is served from 7 to 9 a.m., continental breakfast served from 9 to 10 a.m., lunch from 12:30 to 1:30 p.m., and dinner 6:30 to 8p.m. The Tipsy Turtle Pub is a poolside bar overlooking the beach, specializing in refreshing, tropical drinks, and is the gathering place for guests before and after meals. The bar opens at 11 a.m. and closes at 1 a.m., Monday through Friday; closing at midnight on Saturday. Sunday hours 12:00 noon until midnight.